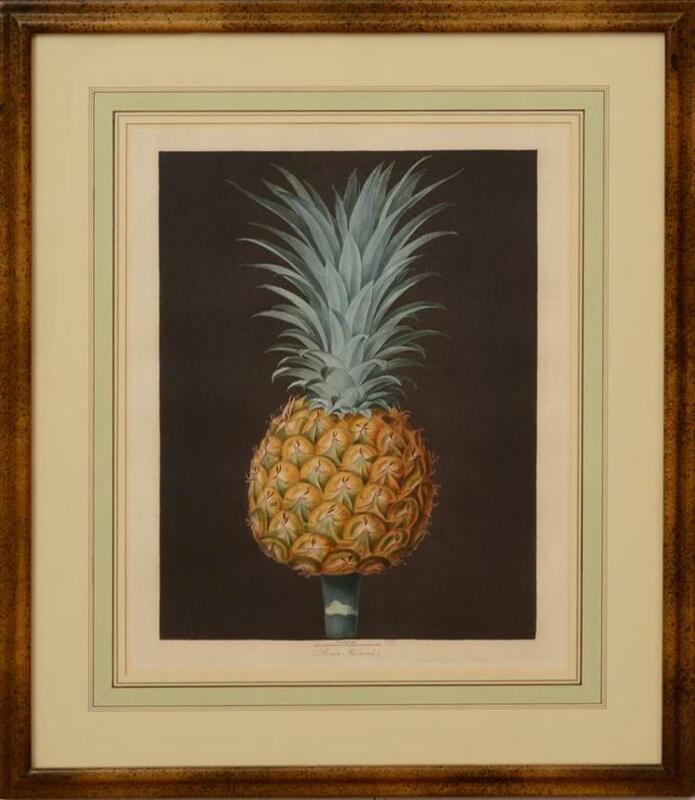 George Brookshaw (1751-1823), was an admired draughtsman of fruits and flowers. At the age of 26 he was working in London as a cabinetmaker with a special talent for painting designs on furniture, which brought him to the attention and patronage of the Royal family. His talent and delight in drawing and painting botanical and vegetal motifs, inspired his magnus opus Pomona Britannica. Brookshaw, himself was over whelmed by the fruits being cultivated, and concerned that the heirloom varieties of English fruit would be lost. Furthermore, he wished to address the country gentlemen and noble estate owners in particular, by introducing them to the abundance of varieties in an effort to encourage more extensive cultivation. Thus, Pomona Britannica was born. Reading like a harvester’s guide (beginning with the early ripening fruits of June, berries, and ending with the late-comers, apples), the work was illustrated with folio-sized, handsomely hand colored plates, detailing 256 varieties of 15 differing kinds of fruits, many against a striking dark aquatinted background. The majority of the specimens were taken from the Royal Gardens at Hampton Court. According to Brookshaw, his work occupied “nearly ten years constant attention and labour” and was terribly expensive due to its large format, with its complicated engraved plates and their attendant printing costs. Brookshaw’s plates demonstrate the perfection in printing that was attained by 19th century British artists and engravers. It is not just the significant historical value of the plates that make them so desirable, but their inherent beauty! Brookshaw’s fruit “portraits” are shown in their natural size, in artistic groupings, with a naturalness that had not been seen. These fruits proudly sport brown spots, worm holes, and curled dry leaves. For today’s audience, Brookshaw’s fruits are a marvel, they are timeless, seemingly contemporary an modern as they float upon the page. We are so pleased to offer such wonderful examples of English Georgian artistry. 23 x 18 1/4 inches sheet. Aquatint with full original hand-color. Full untrimmed margins. Excellent original condition. Framed in faux curly maple moulding, hand painted French wash matting, framed size approx.. 25 x 22 inches overall.